Natia van Heerden isn’t just a top XTERRA athlete (most recently, she finished 4th at XTERRA South Africa). The 2014 XTERRA age group world champ is also an organic chef and believes that what you put into your body is what you will get out in terms of performance. 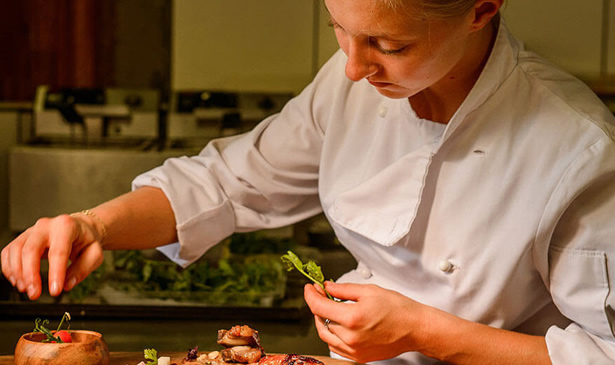 Van Heerden admits that the life of a chef includes long hours, most of which are on her feet, meaning that some days, she doesn’t get to train. However, she wouldn’t change a thing about her life. For me, an ideal day starts with a good flat white. This is a double shot of espresso with velvety, frothed milk on top. Or maybe I’ll have a smoothie made with fruit, ice, macadamia nut butter, chia seeds, raw oats, cinnamon and yoghurt. I like to train for at least 90 minutes in the morning. Typically, in each week, I’ll swim, bike, and run four times each, and I’ll do a brick session as well. Usually, I’ll work out twice a day on the weekdays and once a day on the weekends. I eat breakfast after my training session because the smoothie has worn off. Usually, after I arrive at work, I’ll eat more protein, like eggs, avocado, cheese, or smoked salmon on ciabatta bread that we bake using stone-milled flour. In the morning, I order for the restaurant, answer emails, and deal with management issues. When I was about 14, I started to think of what goes into your body to make it function properly. But I also wanted to enjoy food. So I started cooking at home for my family and really enjoyed it. I went on to study culinary arts, work in the industry and then developed my own style- and that I think is combining cooking and XTERRA. This means I really want people to appreciate the freshness of food, especially vegetables. Lunchtime! I usually eat something salad based, with quinoa, chicken, avocado, cheese, and a fruit. We have lunch service in the restaurant until three, so it’s a busy time of day. On the farm, we grow all our produce, and that inspires me to create dishes that people can relate to and that are both delicious and beautiful. It makes me happy to educate people through farm-to-table dining. More coffee! Then I get in my afternoon training session. XTERRA courses demand that you be fearless and tough so I try to think about that when I train. Until I was 17, I was a gymnast, and that taught me courage but also self-discipline, commitment, mental strength and core strength – all of which I need for XTERRA races. For dinner, I usually eat pasta or fish. If I have to run the next morning, I want to avoid red meat, which can leave you feeling heavy and sluggish. Pasta dishes are also a great way to get more vegetables in. My absolute favorite thing to eat is homemade bread with farm butter, buffalo mozzarella, tomato, and avocado. I can eat that any time day or night. Three to four nights a week I work the dinner service in the restaurant, which makes for a full day.